Does your head hurt from looking over endless mock drafts and lists of prospects for the last two months? Are you ready to just get this thing started already? It’s finally here. The NFL draft starts tonight with the first round, and as we’ve been told about 219221497 times thus far, it’s a pretty important draft for your New England Patriots. Here at Patriots Daily, we’ve tried to gather as much information as we can so we can try and anticipate somewhat the possibilities of what we might expect over the next few days. We’ve watched the games, the combine, we talked to prospects, tracked their contact with the Patriots, and we got together and talked about the direction we thought the team might go in our own two-part Patriots-only mock draft. We’re putting all this information together into this post, as sort of a Draft Central here at PD. 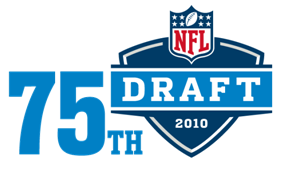 We’ll start out with a reminder of where the Patriots will be picking, in the Patriots 2010 Draft Slots post. Scott Benson put together a complete list of Pats Pre-Draft Visits and Workouts – these visits and workouts are all ones that have been reported on in various media reports. Here at PD, Chris Warner was working the phones hard in conducting over 30 interviews this spring. This Complete List of Patriots Daily Prospect Interviews also includes several conducted by Greg Doyle. To my knowledge, PD is the only Patriots blog that has interviewed this many prospects. Way back when, Doyle also put together a 2010 Patriots Daily Senior Bowl Review which is helpful because at that point we could still judge the prospects on their play, not on all their combine numbers and stats. Similarly, Warner provided a review of the East-West Shrine Game which last year, as he reminds us, was a showcase for future Patriot draftees Myron Pryor and Sebastian Vollmer and undrafted free agent signee Brian Hoyer. In viewing many of the above links, at the end of the article you might see “Tagged With” followed a rather lengthy list of names. We’ve gone through and tagged all the college players we’ve talked about this year – that includes all Doyle’s editions of College Scout during the season. You can click on any of those names, and get a list of all the PD posts in which that player’s name appears. So if the team drafts someone, look for their name, and then you can see all that we’ve previously written about him. A new edition to the PD site is the Twitter window in the right sidebar. That window displays the tweets of the PD staff, which include @scottabenson , @PatriotsDaily (mostly Dan Snapp) and @BruceatPD . Keep an eye on that window during the draft for thoughts from the guys, or add them to your follow list. Throughout the draft feel free to chime in with your own thoughts in the comment section. We look forward to seeing what the Patriots do over the next few days, and weighing in on it here!